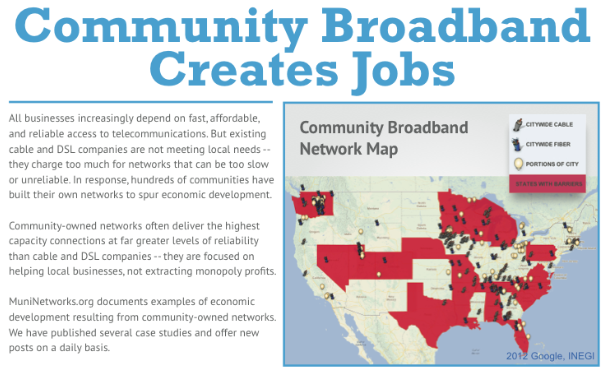 The new Fact Sheet highlights examples of job creation tied to community owned networks. ILSR continually encounters and collects data on economic development spurred by community networks. As demand for more capacity, better reliability and reasonable affordability continues to rise, commercial customers need options. This new economic development fact sheet documents only a few of the many instances when publicly owned networks have met those demands, resulting in new and retained jobs for the community. Download a PDF of this informative and accessible resource. This resource documents jobs created in Chanute, Kansas; Chattanooga and Tullahoma, Tennessee; Lafayette, Louisiana; Bristol, Martinsville, and Danville, Virginia; and Springfield, Missouri. Use the fact sheet to share relevant information with people in the community, business and economic development leaders, lawmakers, or with anyone investigating the possibility of a community owned network in their region. Distribute it freely and often.